Mindfulness is the latest buzzword in health and wellness. You may have noted its increased appearance in blogs or newspapers, noticed a Mindful magazine at the grocery store checkout, or recalled your general practitioner mentioning it at your last health check-up. Mindfulness and occupational therapy can go hand in hand. Mindfulness isn’t just a buzzword, though: it’s a specific set of tools and interventions that can help reduce pain and anxiety and improve quality of life. Incorporating mindfulness into your occupational therapy practice—by combining a variety of interventions including guided meditation, body scans, breathing exercises, or health education—can assist your patients’ recovery and your own capabilities as a practitioner. In my practice, working in outpatient rehabilitation and home health, I have found mindfulness to be particularly helpful for my patients who have experienced life-altering neurological conditions. It has helped decrease their worry and concern about the future and inflated their ability and confidence to manage their own symptoms outside of therapy. Mindfulness is a mental state achieved by focusing a nonjudgmental awareness on the present moment. For most of us, our days and minds are often consumed by thoughts of past and future-oriented experiences. This can lead to anxiety, depression, issues with sleep, difficulty with pain modulation, and decreased engagement in occupations. In contrast, when you practice mindfulness, you work towards present-centered attention, acceptance of current experiences, and greater awareness of self and the mind-body connection. This allows you to be fully present in your current task, situation, and state of mind. It is a learned skill (Mani, Kavanagh, Hides, & Stoyanov, 2015). Mindfulness is not simply a redirection of attention or participation in the occasional meditation session. Mindfulness requires repetition and practice. With practice and repetition, fMRI studies have shown that mindfulness can actually produce positive changes in your brain’s structure (Alice G. Walton, 2018). In this way, mindfulness and occupational therapy can positively impact each other to the benefit of your patients - and for you as a therapy practitioner yourself! 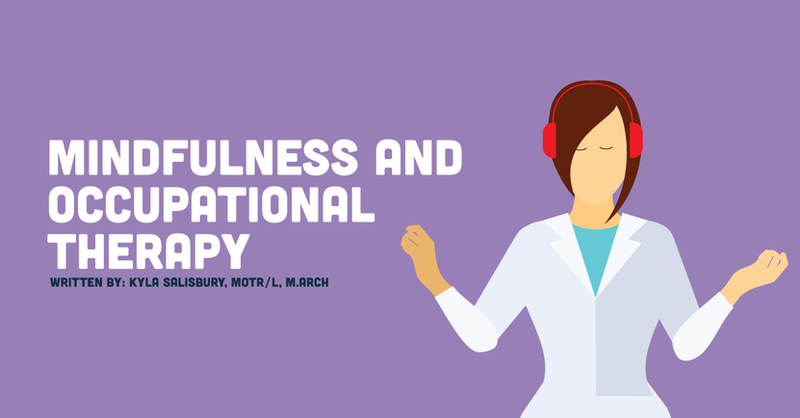 Whether you work in mental health, physical rehabilitation, with neurocognitive and neuromotor disorders, geriatrics, or in pediatrics, there are a number of ways to wrap mindfulness into your occupational therapy practice. Mindfulness must include education and training for your patient to create and experience new neuronal connections and become successful in their practice. A majority of current evidence exists highlighting mindfulness as an effective intervention for both mental health and health promotion. New research also suggests occupational therapy and mindfulness may support each other during the rehabilitation of physical dysfunction, neurocognitive and neuromotor disorders, geriatrics, and pediatrics (Hardison & Roll, 2016). How can occupational therapy and mindfulness work together? To understand how occupational therapy and mindfulness may be effective together, let’s consider what target areas mindfulness interventions may address. Research suggests one area where mindfulness practice is effective is that of pain. Pain is a multifaceted animal, with everything from emotions to personal life stressors to social situations affecting your patient’s pain experience. Early research in physical and occupational therapy suggests that for both acute and chronic pain conditions, mindfulness has the potential to improve pain acceptance as well as buffer other psychosocial issues. A scoping review of mindfulness interventions by Hardison & Roll (2016) found mindfulness interventions significantly reduced pain severity in three studies and showed significant improvements of pain acceptance, improved functioning with pain, and reduced distress in a fourth study. Try adding mindfulness for pain reduction whether your patients are experiencing a wrist fracture or a neurological condition. Whether pain is persistent or intermittent, acute or chronic, mindfulness tools can help your patients ease their experience. As previously mentioned, a majority of people spend their days thinking of past or future-oriented experiences. Sometimes these thoughts can lead to worry or anxiety—especially for those experiencing an illness, disability, or age-related change. Through learned mindful attention and refocusing on the present moment and current lived experience, your patients (or your as a practitioner, as well!) may learn to reduce the volume of distracting thoughts that provoke worry and anxiety. In occupational therapy, mindfulness may help your patients better adapt to illness or disability and improve self-efficacy in the management of their illness or disability (Hardison & Roll, 2016; Shennan, Payne, & Felnon, 2011). Another great target area for mindfulness interventions is self-regulation. Aspects of mindfulness including the body scan and breathing exercises help improve an individual’s self-awareness regarding their body and the sensations and emotions they are feeling. Mindfulness can even have a direct somatic impact of lowering heart rate while practicing. Mindfulness helps improve the mind-body connection. For women experiencing urinary incontinence, one study by Baker, Costa, & Nygaard (2012) showed individuals participating in mindfulness interventions had significantly fewer incidents. Additionally, mindfulness may be a great, creative adjunct for occupational therapists teaching self-regulation and body awareness for children in pediatric or school based settings. Many of your patients facing chronic pain, neurocognitive or neuromotor conditions, or a change in health status may experience issues with sleep deprivation or excess engagement in sleep. Sleep is an occupation: it is vital to health and well-being and can directly impact effective participation in other occupations. Since mindfulness directly benefits psychological, somatic, and behavioral aspects of life, mindfulness may also assist in optimizing sleep (Mani et al., 2015). When addressing sleep in occupational therapy practice, practitioners often evaluate sleep dysfunction and provide interventions to optimize sleep performance. One important intervention is the development of and recommendations for sleep hygiene routines. Sleep hygiene routines often involve regular routines for waking and sleeping and the development of habits that facilitate sleep. Mindfulness can calm an overactive mind, reduce stress, and regulate breathing and heart rate in preparation for sleep. In turn, this will promote sleep quality, improve sleep duration, and reduce sleep-related impairments during waking hours. For your patients experiencing sleep difficulties, adding mindfulness practice to their bedtime routine may be a helpful tool to facilitate sleep. Work with your patient to develop a personalized routine and help them select an app or book to work on their mindfulness practice. In my practice, I have seen a direct positive change in the number of hours slept when implementing mindfulness into my patients’ bedtime routines. As occupational therapists, enhancing quality of life is a key component to our profession. I feel it is not uncommon, yet frequently overlooked, that individuals may experience situational depression or decreased well-being following even a minor accident, injury, or change in health status. When a person is not able to be independent or engage in activities per typical, they may feel downtrodden or symptoms of malaise. Enter mindfulness and occupational therapy. Mindfulness has been shown to improve patient acceptance, tolerance, and patience while increasing their openness and gratitude for life (Mani et al., 2015). This, in turn, reduces situational depression, improves physical health and well-being, and increases your patient’s quality of life perception. For a therapist starting to incorporate mindfulness into their practice, it’s important to first research the common mindfulness interventions: general mindfulness, mindfulness-based stress reduction, and acceptance and commitment therapy. General mindfulness takes mindfulness principles and applies them directly to a patient and the patient’s goals. Mindfulness-based stress reduction works to improve “trait-level” mindfulness in patients. Acceptance and commitment therapy is a more psychological approach that stems from behavioral analysis and mindfulness principles (Hardison & Roll, 2016). Next, get creative in designing your mindfulness interventions specific to your patient population and setting. Remember to include the key components: guided mindful meditation, body scans, mindful movement/mindful yoga, breathing exercises, and patient education. Incorporate components of mindfulness into sessions as preparatory activities, occupational activities, education and training, and group interventions, depending what’s appropriate for your practice. When writing goals concerning mindfulness, goals may include pain management, increased participation in therapy, increased engagement in occupations, reduced anxiety, and improved body and sensory awareness, depending on your patient’s needs. Finally, provide your patient with homework to improve generalization of mindfulness to daily life. One way patients may engage in mindfulness homework may be through the use of mindfulness apps. A study by Mani et al. in 2015 assessed 700 available mindfulness-related apps for engagement, functionality, aesthetics, and information quality. Four percent were found to receive an acceptable score based off of the study’s rating tool with the top four as follows: Headspace, Smiling Mind, iMindfulness, and Mindfulness Daily. Since this study was published in 2015, a new player has entered the game—Calm—and has also received great ratings and reviews. In conclusion, no matter the setting, mindfulness and occupational therapy together offer a variety of benefits to you and your patients. Do you already incorporate mindfulness into your occupational therapy practice? Let us know how in the comments! Apple Watch - A Physical Therapy Tool or Not?